Inventory We are a resale marketplace, not a box office or venue. Ticket prices may exceed face value. This site is not owned by Selland Arena . Selland Arena is a multipurpose arena built in 1966. It is named for the former Fresno mayor, Arthur L. Selland. 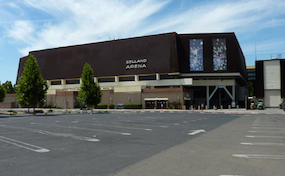 The Selland Arena is part of a four-venue complex of the Fresno Convention and Entertainment Center. Over ten million people have entered the Selland Arena. Its capacity has grown from 6,582 through expansion projects to 11,300 people for concerts. The final expansion project included the installation of new seats, a new video replay scoreboard, message boards, and an ice cooling system for hockey games. Selland Arena is home to the Fresno Monsters of the North American Hockey League and Western States Hockey League. Selland Arena has hosted concerts, conventions, ice shows, youth sports, professional sports, motocross, rodeo, religious events, graduations, and community events. A few notable events have been Van Halen, the Grateful Dead, Cher, Elvis, Elton John, Aerosmith, ABBA, and other major music groups and talents. ArenaFresno.com is not currently affiliated with any box office, venue, website, or official supplier. We are a privately owned and operated company that specializes in offering tickets to all events in the resale secondary ticket marketplace. Prices on our sites can be well below or above face value but will change quickly with demand. To order tickets to all Selland Arena Fresno California events please call our friendly staff at anytime or follow the steps online through checkout.